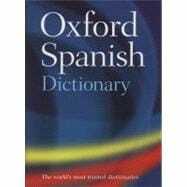 A fully updated edition of the Oxford Spanish Dictionary. With over 300,000 words and phrases, and 500,000 translations. 2,000 new words for both English and Spanish. Lots of support for students and professionals using Spanish, with coverage of EU terminology, business and law terms, andupdated ecology vocabulary. Ideal for students spending their year in Spanish or English speaking countries, or for those buying a home abroad, with sample utility bills, bank statements, rental agreements, car documentation, correspondence and CV examples.Lots of cultural notes are included for information on life in Spanish and English speaking countries. A clear colour layout makes finding the translation you need quick and easy.